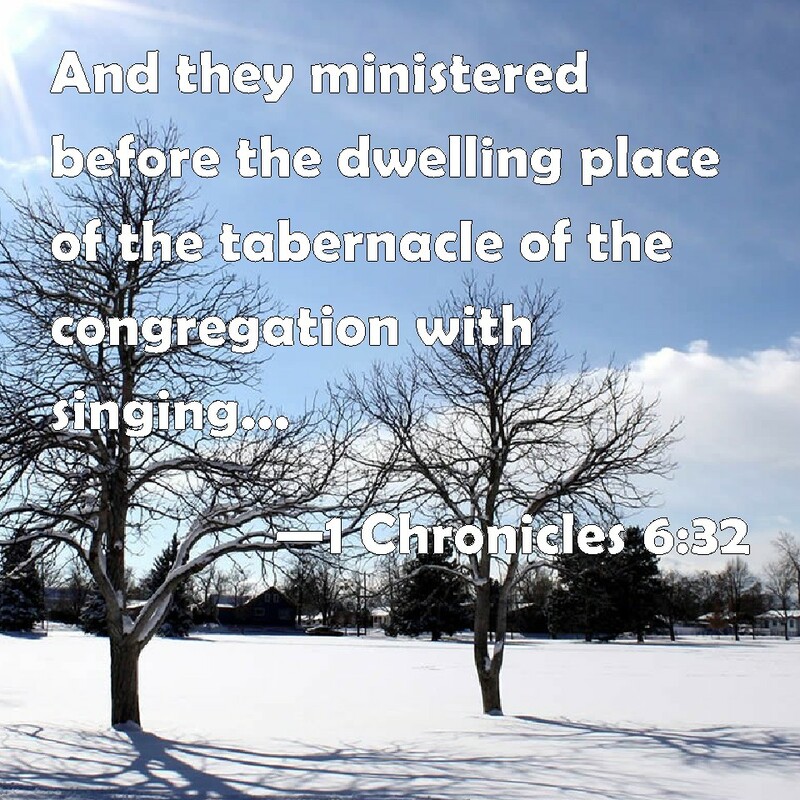 1 Chronicles 6:32 And they ministered before the dwelling place of the tabernacle of the congregation with singing, until Solomon had built the house of the LORD in Jerusalem: and then they waited on their office according to their order. KJV: And they ministered before the dwelling place of the tabernacle of the congregation with singing, until Solomon had built the house of the LORD in Jerusalem: and then they waited on their office according to their order. DRB: And they ministered before the tabernacle of the testimony, with singing, until Solomon built the house of the Lord in Jerusalem, and they stood according to their order in the ministry. DBT: And they ministered before the tabernacle of the tent of meeting with singing, until Solomon had built the house of Jehovah in Jerusalem; and they attended to their office according to their order. ERV: And they ministered with song before the tabernacle of the tent of meeting, until Solomon had built the house of the LORD in Jerusalem: and they waited on their office according to their order. WBT: And they ministered before the dwelling-place of the tabernacle of the congregation with singing, until Solomon had built the house of the LORD in Jerusalem: and then they waited on their office, according to their order. WEB: They ministered with song before the tabernacle of the Tent of Meeting, until Solomon had built the house of Yahweh in Jerusalem: and they waited on their office according to their order. YLT: and they are ministering before the tabernacle of the tent of meeting, in song, till the building by Solomon of the house of Jehovah in Jerusalem; and they stand according to their ordinance over their service.